Is Nurse Frustration Damaging Your Patient Satisfaction Scores? 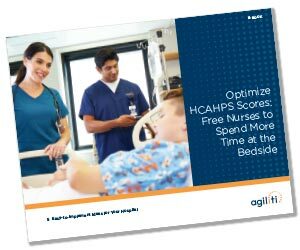 Much of the responsibility for generating high HCAHPS scores rests with nurses. They spend the most time with patients and largely embody the character of the hospital. Yet, the typical nurse spends 75% of their time away from the bedside on non-patient care tasks. Not only does this increase their levels of job frustration, but it has a cascading effect on the patient experience. Learn strategies to help return nurses to their primary goal –quality patient care. Complete the form to receive the E-Book.